Local ingredients. International flavors. New American cuisine. Executive Chef Eric Floyd is committed to finding new ways to use local and environmentally responsible ingredients to delight and impress you. 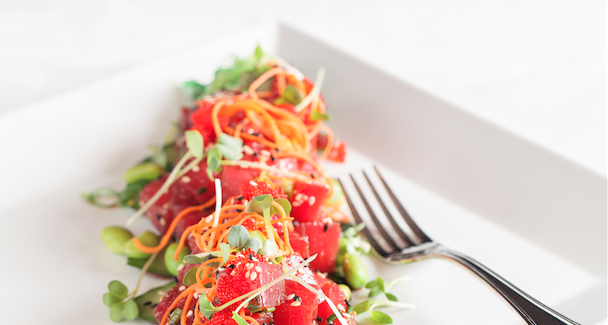 Explore a dynamic large plate or several small plates while overlooking downtown Seattle. Quench your thirst with one of our specialty craft cocktails from the bar, or a glass of wine from our extensive wine list. And while you’re here, keep an eye out for the Smart Catch logo, which celebrates the WAC’s commitment to serving sustainable seafood. Choose from our breakfast menu, lunch menu, dinner menu, happy hour specials, or dessert menu. Try one of our popular specials from our All-Star Month menu during September and October. Torchy’s Gold and Silver rooms are private, boardroom-style meeting spaces with full amenities for up to 10 people. Reserve: catering@wac.net or 206.464.3050. Enjoy half-price appetizers and $1 off all draft beers. Validated WAC Parking with a minimum $25 purchase after 5 pm (excluding holidays).